Riverside, Iowa – The Iowa PGA is happy to announce the Principal Charity Classic®, presented by Wells Fargo, the annual and award-winning PGA TOUR Champions event in Des Moines, will celebrate its 10th anniversary as title sponsor of the Iowa PGA Junior Tour in 2019. The Iowa PGA and Principal Charity Classic have been partners since 2010. In addition to financial support, the Principal Charity Classic provides tee gifts and other competition prizes for Iowa PGA Junior Tour competitors throughout the season. The Principal Charity Classic is dedicated to helping Iowa kids succeed. The tournament has raised nearly $18 million for charities and schools throughout Iowa since 2007, including a record $4,356,321 last year. The 2019 Principal Charity Classic will take place May 28-June 2 at historic Wakonda Club in Des Moines, with Tom Lehman as defending champion. Tickets are available now at principalcharityclassic.com. 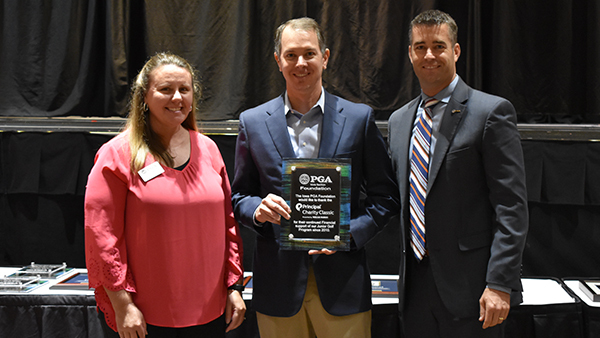 The Iowa PGA is honored and grateful for the Principal Charity Classic’s decade-long partnership, and we look forward to another great Junior Tour season together.